Yeah, that’s what we call a burn. 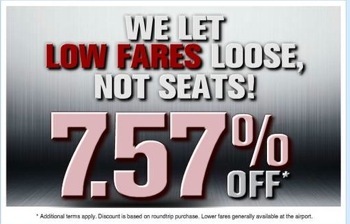 Not a company to let a juicy opportunity for mockery slip by, Spirit Airlines is poking fun at American Airlines’ loose-seat woes with a new 7.57% discount promo. It’s not even a tongue-in-cheek situation — the tongue is fully out of the mouth and wagging at American with: “WE LET LOW FARES LOOSE, NOT SEATS! 7.57% OFF.” Wait, I don’t get it. Ohh hang on… the fares are loose (and therefore cheap?) just like those rows of seats on American Airlines’ 757s that weren’t bolted in correctly. I see what they did there. As USA Today points out, rival companies often poke fun at each other, but rarely in such a blatant way. Sure, the ad doesn’t add, “JUST LIKE THAT THING THAT HAPPENED WITH AMERICAN AIRLINES,” but it doesn’t really need to as we’re all quite aware of the airline’s recent problems. Quite generous of Spirit to offer a discount of any kind, especially seeing as how the company just announced fee hikes for passengers with carry-on bags. Next Will A T-Mobile/MetroPCS Wedding Be Good Or Bad For Consumers? Next Up: Will A T-Mobile/MetroPCS Wedding Be Good Or Bad For Consumers?